Rachel Goldenberg knows all about close shaves. 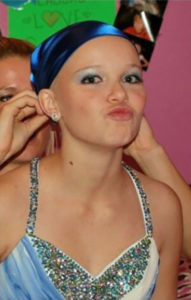 When the West Palm Beach native was 15 in March 2010, she was diagnosed with Hodgkin’s lymphoma, a cancer that originates in white blood cells. So while her peers were worrying about teen stuff like dating, pop music, clothes and social-media status, she worried about four months of chemotherapy, two weeks of radiation and an uncertain future. Rachel Goldenberg when she was undergoing treatment. Now cancer-free five years, the junior special-education major has a perpetual smile on her face. Goldenberg survived that close shave with her own life and now promotes countless other close shaves that could help save the lives of others. She’s one of the student organizers of FGCU’s annual St. Baldrick’s Day fundraiser, which this year takes place from 11:30 a.m. to 5 p.m. Thursday, Nov. 3, at the Veterans Pavilion on the Library Lawn. The event involves participants collecting pledges to get their heads shaved; proceeds go toward childhood-cancer research and education. It’s part of a nationwide campaign that originated as an inspirational offshoot of a St. Patrick’s Day party in 2000 at Jim Brady’s pub in Manhattan. 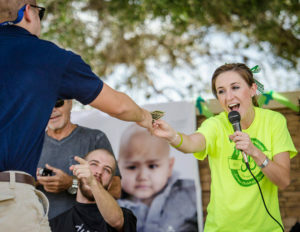 Along with fellow student organizers Karen Muhl, Nora Johnson and Maddie Quinn, Goldenberg hopes the FGCU community will back these buzz cuts of benevolence enough to top last year’s campus hairfall: 21 community sponsors and about 200 shaved heads that brought in a total of almost $16,000. That’s a big leap from the first St. Baldrick’s Day event at FGCU in 2011, orchestrated by then-student Catherine Gorman (‘12, B.A., ’14 M.A., English) now FGCU’s mentoring and special programs coordinator; and her sister Claire (’14, Management), who’s now assistant director of major gifts in University Advancement. The inaugural shave had five sponsors, some 100 heads under the razor and a take of about $3,300. Catherine Gorman collects donations for cancer research while a volunteer gets his head shaved. Indeed, Goldenberg not only leads, but does so by example. She personally collected $1,800 last year and has more than $1,330 in pledges for this year’s shave, with a goal of $2,000 going into the final days. Much of her fundraising is done through personal networking and social media — an easier path than the one she originally beat by foot, collecting door-to-door when she started her high-school event. “The reason I’m most passionate about this fundraiser compared to others is because it’s not only for childhood-cancer research, but that a lot of that research is on the aftereffects of cancer treatment, what’s known as ‘chemo brain,’” Goldenberg said, referring to memory loss and a general feeling of mental fogginess — symptoms she herself deals with. Meanwhile, before Gorman passes the torch completely, she’s quick to credit others who work hard to make the charitable cut. She cites Zack Eaton, an FGCU alum and owner of Jimmy John’s Gourmet Sandwiches off Alico Road, who gets his own head buzzed and donates food; the stylists at Zervos’ Salon in Gateway (and through Zervos’, the Paul Mitchell Focus Salon), who close their shop on St. B’s Day and handle the clippers; San Carlos Park firefighters, who will come Thursday bearing raised funds and hairy heads to shave; and what Gorman calls “former shavees” and more than 40 other volunteers who help stage the campus event. Beyond those behind the scenes are faculty and staff members who volunteer on the front line — in the barber’s chair, sacrificing their follicles for a noble cause. This year’s FGCU “celebrity shavee” lineup includes: Dr. Clay Motley, Honors Program director; Dr. Billy Gunnels, undergraduate scholarship director; Chuck Bryan, library systems engineer; Jacob McAbee, residence life coordinator and instructor; Dr. Michael Cole, assistant history professor; Dr. Jaffar Ali Shahul Hameed, associate math professor; Jack Flaherty, WGCU production assistant; Matthew Neubek, math instructor; and Carolina Contreras, accountant and grants specialist in the College of Arts and Sciences, who has the distinction of being the only female on the faculty-staff roster, but will be joined by several others of her gender under the razor. “The women who volunteer to get their heads shaved for this cause are truly amazing,” Gorman said. Full disclosure — Gorman won’t be among those women willing to go naked on the noggin. Nor will Goldenberg, for a rather obvious reason. “I already lost all my hair once,” she said with a smile.